During my visit to Australia and the Asia Pacific region last November, a recurring theme has been about the details required for accurate planning. There’s a tendency to focus on the final profit and loss (P&L), balance sheet, and cash flow statement when thinking about budgeting and planning. However, understanding the operational side of the business is integral to this process. It requires incorporating operational drivers and key metrics. These are often non-financial measures or non-numerical attributes that are critical to proper planning. Your operational drivers and metrics will vary depending on the industry. For example, in Australia and New Zealand, at many agriculture, mining, and manufacturing companies, drivers and metrics are tied to production output, weather conditions, commodity prices, customer types, payment terms, and other measurable items. Incorporating operational data during the budgeting and planning process is inherently difficult when relying solely on spreadsheets. The granular nature of operating data, which may be daily, weekly, by customer, operating location, can turn spreadsheets into a giant mess. Customers I spoke to say their analysts may spend weeks trying to process the data using spreadsheets before they can even link it to a plan. Spreadsheet can also balloons to several hundred megabytes, making it impossible to share with others. Another limitation is the inability to make changes on the fly. These mega spreadsheets are inflexible as the slightest change can break all the links or data feeds. 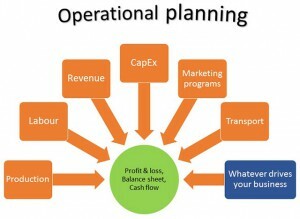 Prophix has long recognized the need to integrate operational drivers and metrics with the budgeting and planning process. Our Detailed Planning Manager takes the guesswork and mechanics away, making it straightforward to add operational details to any planning process. Detailed Planning Manager provides a graphical user experience for creating operational plans featuring non-financial drivers and non-numerical attributes. As it was purposely designed after speaking to hundreds of clients, and based on years of experience, there is no customization or programming involved. Effective operational models, capturing information at the required level of detail, linked to the P&L, balance sheet, and cash flow, can be developed very quickly. As Detailed Planning Manager is not a separate application, anything created also enjoys the benefit of workflow and process management, improving collaboration across the organization. Detailed operational plans can be assigned for completion by the operational managers who understand their business best. While data can be scheduled to be imported at automatic intervals. I have been humbled and overjoyed at how our customers have embraced Detailed Planning Manager, with many using it for unique applications I never imagined during product development. With Detailed Planning Manager, operational details should not take a back seat during the planning process. The devil’s in the details! As Vice-President of Product Planning, Geoffrey is responsible for managing the long-term product and technology strategy at Prophix. Geoffrey began his tenure at Prophix as a management consultant leading the implementation of financial analytics systems at over 70 organizations throughout North America.